With all the help and ideas on painting black that were submitted by everyone, I thought I would put them together in one post as a showcase and a way to say thanks. A handful of folks either left comments with links or emailed me directly with potential solutions to "how to paint black." For everyone who did, thank you. The Blue/Turquoise highlighting on the Brother Captain was done by adding successive amounts of Reaper Marine Teal to chaos black until a final fine highlight of pure MT. To sum up a base coat in some gray (lighter) black with darker washes on top, then some silvers in the joints to add pop. On thing that really helps this model out is all the golds and brass. The extra bits, is were the eye is drawn. Get those right and not many people will notice what underneath. Come to think of it, it like the little black dress. The dress is simple and plain, you only notice it if the colour is faided, but it's the contrast with the flesh and neck adornment that brings the pop to the ensemble. So if I had to do this again, I would keep the black simple and focus on the details. Carl's analogy here is perhaps my favorite one ever. Thanks Carl! I thought about using the charadon granite and black wash about a year ago, however I always thought it too 'brown' in nature. I am currently doing a commission based on the Howling Griffons night scheme in the latest imperial armour book. Whilst the whole thing is yet to kick off, I have done a test mini using Adeptus Battlegrey as a base, shaded using a Badab Black wash. The results are great, in that you get the recesses shaded as you want but also a lot of control over where you put shadows. I've gone for two coats of the wash, which gives me a very dark grey figure - I think this looks a bit more natural than say chaos black with a hard lighter grey edge highlight. I have gone in and added a line highlight with Adeptus Battlegrey, and this makes the mini pop that bit more...I use Winsor and Newtons Series 7 brushes, and a brand new one of those makes edge highlights easy! When I first started working out how to paint my black armoured space marines I came to pretty much the same conclusions as you have. I started of with a line higlight of 60:40 chaos black/codex grey and then went back over the extreame edes with pure codex grey. 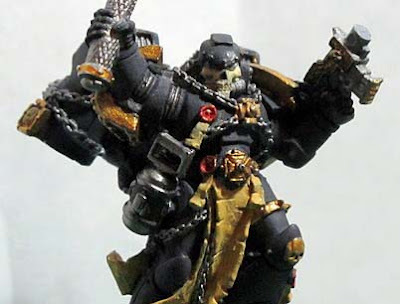 I think the trick is not making your final higliht to bright as it will provide to much of a contrast with the black and to also use your final highlight sparingly as to much of it will make the model look contrived and unatural. 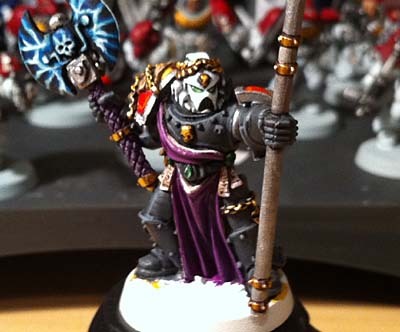 I've found that chaos black+codex grey 4:1 as a base is good, then 4:2 for a general highlight, with a touch of skull white added for final line highlighting works quite well. You then wash the whole area with badab black to blend them all together and accent the most shaded areas. Painting historical miniatures Black is a lot easier - just highlight with Flesh! 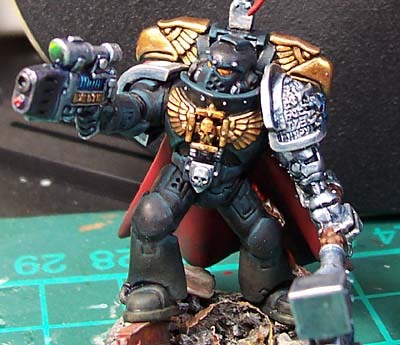 Might want to try Adeptus Battle Grey followed with a black wash. He suggested this tutorial from the guys over at Massive Voodoo as a way to develop a better understanding of what we're trying to accomplish. Second, I do a drybrush with Vallejo´s Luftwaffe grey. Third, I do a highlight in the upper parts of the minis with a watered down Vallejo´s French Grey. If I missed anyone, I apologize... if you've got a link or tip about painting black that you want to share, send it to me and I'll get it added. Thanks once again folks for all the help. a method i used when painting the wheels of my cargo-8 (pictures yet to appear on my blog) is something a lil out of the ordinary in my opinion. first i coated the wheels in the fenris foundation paint, that real dark blue-grey, so all the black area had a even covering. then, using 'Penguin Indian Ink' (thats the only lable on the bottle, used for re-filling fountain pens) straight out of the bottle, i coated all the areas i previously painted that blue-grey with 2 even coats. due to the make up of the ink, it flows away from hard edges when applied evenly, leaving small hard edge highlights. i foudn the contrast too high, so toned it down with another coat, makin sure i got coverage over previous lines left behind. I love the new color theme. Black can be trouble. I have noticed in my own work that if you are going for th hard highlights (which make models look like they are wrapped in vynil) than you need to make the look work straight from the start. The way I get that vynil luster without gloss is to coat the whole model after priming in Badab Black, then detail the whole model and and save highlighting the black for last. Clear up any mistakes in chaos black and you will have a model that looks like it fell right out of WD ... which is OK if that is what you are looking for. Thanks for the additional links guys! Old School Terminator: I've learned through all this that I like the crisp line highlights on black. On other colors, the zenithal effect can have great results. I think I'm going to blend the two together a bit (leaning more towards the line highlighting). Now I'm looking to really incorporate my weathering so it doesn't look like an afterthought. Just got me some Death Company so I will be trying out some of the suggestions here.